I recently discovered a book which has intrigued me more than usual. It is called Havah, the story of Eve, by Tosca Lee. 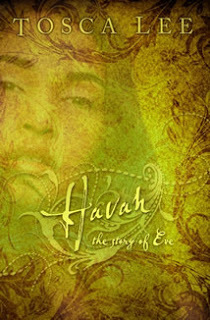 Havah is a first person account from Eve’s beginning of consciousness. Tosca Lee so beautifully describes the garden I was moved to tears at the fall. Maybe it was easy for me to become emotionally tied to the story because Eve is, after all, an ancestor. But the writing is definitely beautiful and descriptive. Every time I read it one word came to mind: sensual. Many senses are tantalized in her description of the sights, sounds, scents and emotions. The build up is so intense, I personally wondered what the fruit tasted like. Eve is frequently given the blame for our fallen world but in Havah the temptation by the servant is eerily, um, tempting. The most poignant part of the temptation was how he tickled her pride and told her she would be just like God. I was reminded again how many groups have based their whole religion on that single pursuit: becoming like God. The intimacy described in the garden compounds Eve’s loneliness outside. I chuckled many times about the frustration Eve had when Adam did not understand her. Maybe wives all over have a legitimate complaint for their husband’s insensitivity — the husband/wife relationship was designed to be more closely linked. After they left the garden my heart hurt again as Eve clung to the promise that her seed would crush the head of the serpent. Eve had in her mind that her child would lead them back to the garden. The themes are too adult, in my opinion, for a younger audience. It is a book worth reading though, and in the end — I am overwhelmed by how much I long for the garden.